2. Yes 1 person can attack 5 times and each enemy can only be killed once. I guess that, if someone fails to defeat the enemy, the enemy will be damaged and another member can attack the same enemy. So if #3 is defeated the others can only attack #4, meaning it is first come first serve. It is possible that 2 members defeat the Instance without the others being able to do anything, but highly unlikely since you have to get into the battle and skip/watch it. Meanwhile you can already attack the next stage. 3. No, once you paid the 2k Guild Points to open the Instance you can enter it once. Afterwards when you want to challenge the Instance again you only have to spend 1k Points. If you want to challenge it a 3rd time you need another 1k Points. 4. Yes, 1 Vit spent means you get 1 Active point. If it is capped at 470 for you, your members can only contribute 470 Active Points every day. But if you think about it normally you won't stack Vit and you'd only get around 350 Vit per day. 5. I'm deputy so I don't know how it exactly works, hopefully someone else who is Guild Master can explain it. 1. If you click on the necklace which is over the Weapon Slot you will see that there are several colors/levels. Your current level is marked with an orange square( if you hover over another necklace the square will go over there) , but you can also see it if you hover over the eye were the hogu tab formerly was. And there you will see all the stats you currently have. If you still have questions, or if my answers couldn't help you, feel free to ask and I'll try to answer them. I probably should I waited for this guide. I already messed up. Anyways thanks for making this guide. Guild Instance and Guild Shop both give items that require a quantity higher than 1 in order to activate or equip. 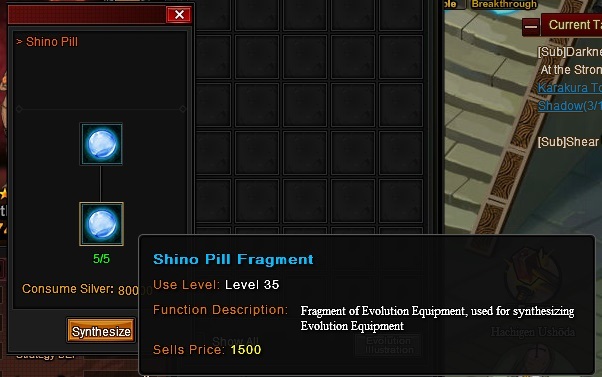 Hence the "fragment of evolution used for synthesizing evo equip"
Completing guild instances gives Shop items and coins. After level 3 it becomes harder to level up since you waste a lot more vitality, unless your guild is super active and supportive. Can't find a pattern in extra starting Fury, it's just random. would u mind showing in more details plz? GMT-5, 2019-4-25 18:42 , Processed in 0.026476 second(s), 9 queries , Xcache On.